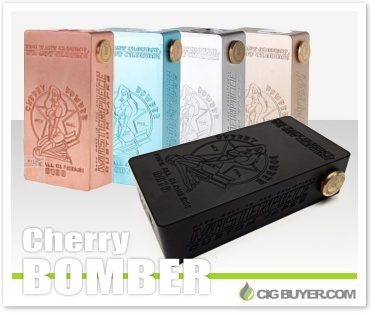 Made by Masterpiece Custom Vapes (MCV) in the Philippines, the Cherry Bomber Mod is an awesome mechanical box mod designed for single or dual 18650 batteries. The original has an all aluminum body with sliding battery door, brass firing pin with twist lock, adjustable copper contacts, and no wires – meaning minimal voltage drop. What really sets it apart, though, is the unique and stylish engravings that cover the front and side of the device.